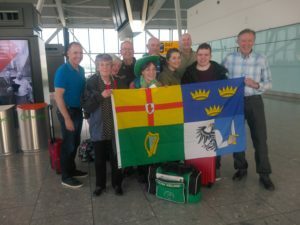 The Irish teams at Heathrow yesterday. Team Ireland x 3 have all now arrived safely at their destination in the Lethbridge Lodge. It was a long day traveling yesterday but a good sleep and a reviving shower followed by great coffee and a cinamon bun worked wonders. The receptionist here is from Cork City so she is now going round with a ‘Wilson Ireland’ mini kit pinned proudly to her chest. Seniors have a quiet day today but we will all get the shuttle bus into the stadium later to watch Neil and Alison practice ahead of their first game against Italy tomorrow.